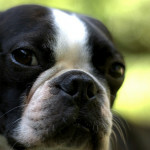 Often called the Boglen Terrier, the Boston Beagle Terrier mix is a cross breed between a Beagle and a Boston Terrier. These dogs are small to medium sized and they have a great temperament as well. Of course, like other hybrid dogs, it can sometimes be difficult to predict which parent a Boglen Terrier will take after when bred. For this reason, it’s a good idea to consider the histories of both parents. Learn more about the Beagle Boston Terrier mix by taking a closer look at its origin, temperament, appearance, grooming needs, and overall health. Since the Boston Beagle Terrier mix is a hybrid dog, we don’t currently know a whole lot about how this mix was started. It’s likely that it was started within the past couple of decades, since the popularity of designer dogs has skyrocketed within the last 30 years. Although we don’t know much about the origins and history of the Boglen Terrier, it’s possible to gain some helpful information by looking at the history and origin of both the Beagle and the Boston Terrier. Dogs that looked much like Beagles were seen in Roman times, although these weren’t the same dogs we know of as Beagles today. Today’s Beagle has a history that is a bit unclear. The dogs were thought to be bred as hunting dogs in the mid 1800s. Later, they would come to the United States, which is where they were used for hunting purposes and bred by hunters to be the smaller dogs we think of today. They were used to hunt alone and for pack hunting as well. These dogs continue to be popular and are still used for hunting today, although they also make fine companion dogs. Experts believe that modern Boston Terriers probably all trace back to one dog called “Hooper’s Judge,” who belonged to a Bostonian, Robert C. Hooper. This dog was a cross between an English Bulldog and an English Terrier, although he was said to have resembled the Bulldog more strongly. It’s thought that later some French Bulldog may have been added to the bloodline, potentially to reduce the dogs in size. The American Bull Terrier Club was organized in 1889, but the club name was opposed by Bulldog and Bull Terrier fanciers who did not like the confusing breed names. Later, the Boston Terrier Club was formed in 1891 and the breed was named the Boston Terrier after the city of Boston where it originated. In 1893, the Boston Terrier was admitted to the AKC’s Stud Book and the breed club was added as a member of the AKC as well. The breed spread throughout the world, reaching Europe in the 1920s and becoming one of the most popular purebreds within North America in the 1950s. It continues to be a popular breed today. The Boston Beagle Terrier mix is a small dog that usually weighs in at less than 25 pounds. In many cases, they look a bit more like the Boston Terrier, with pointed hears and the squarish face of the Boston Terrier. They have a short haired coat that comes in a variety of different colors, since both the Beagle and the Boston Terrier are known for having a color patched body. The patterns can vary greatly from dog to dog and colors can include white, black and white, orange, brown, and combinations of these colors. Both the parent breeds are very friendly, so the Boglen Terrier is a very friendly dog and it’s also very playful. In most cases, these dogs are playful and friendly with children as well, and they enjoy snuggling with their family. These dogs do get their sense of smell from the Beagle, which means that they can get a bit distracted by the smells around them. The Boglen Terrier may inherit a bit of stubbornness from the Boston Terrier, so they may try to be a bit dominating from time to time. Early training is important and you’ll need to put boundaries and rules in place. Housebreaking your Boston Beagle Terrier mix can take some time, and it may take them longer to catch on to housebreaking than other dogs. Since they do have a lot of energy and they love to play, regular walks, playtime, and mental stimulation is essential. Since these dogs have a short coat, they don’t shed a lot, but they do shed some. Brushing their coat regularly will help keep the shedding of your Boglen Terrier to a minimum. Other routine grooming tasks include cleaning their ears regularly and checking them for any problems. Since they are small dogs, dental problems can be an issue, so brush their teeth at least three times a week. Their nails may also need to be clipped regularly if they don’t wear them down naturally. The Boglen Terrier is generally a beloved pet and companion and is not used in any working roles. I adopted my Bolglen at about five year old. She had a rough time as a pup then, in another home, had to deal with two pit bulls. So, she had a real trust issue when I got her. Now, after a year with her, I can’t believe how smart and understanding she is. She seems to understand me outside direct commands. I’ll talk in conversational language and she picks up on what I want. Now look, I’ve had many dogs throughout my life, all loving pets, but this one is different. She seems to be aware.